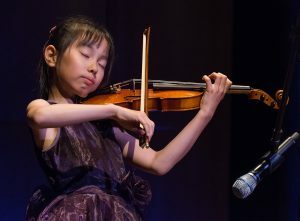 6th Annual Heart of a Child concert - Resounding Joy Inc.Resounding Joy Inc.
On April 22, over 300 guests gathered at Qualcomm Hall for our 6th Annual Heart of a Child concert, raising money for the Ariana Miller Music with a Heart program. Ariana Miller lost her battle with severe congenital heart disease at the age of 13, but her love of music lives on through the Music with a Heart program at Rady Children’s Hospital. The program ensures that children experiencing cardiac distress or disease receive no-cost music therapy when they are hospitalized or home-bound by sickness and disability, just as Ariana did. With 20 performances by young musicians and groups throughout the night, Heart of a Child has become the premier showcase of young local talent. Music with a Heart allows Ariana’s love for music to live on and help countless other children the same way she was. This year’s concert was able to raise over $78,000 – a $10,000 increase from last year. With help of the money raised, we are able to carry out individualized music therapy to patients in cardiac unit at Rady Children’s Hospital – San Diego (RCHSD), where, according to Dr. John Lamberti, chief of the Cardiovascular Surgery Division, “The music therapy program has become an integral part of our treatment program at RCHSD.” Along with this program, Resounding Joy is also able to provide in-home music therapy sessions, developing a therapy plan with the family to help patients meet their goals and bring about a sense of normalcy in their day-to-day lives. 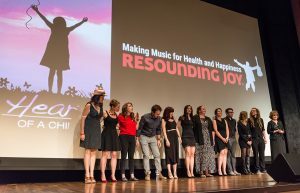 Resounding Joy uses therapeutic and recreational music programs to improve the social, emotional, physical, and spiritual well-being of individuals and communities.